It is with mixed emotions that we have decided to close the B&B, and thus, we are no longer accepting reservations. During our thirteen years of operation we have met so many wonderful people and made enduring friendships. We hope that we have given you lasting memories -- memories that you will cherish. We truly appreciate your loyalty and sincerely hope that you will stop by and say hello upon your next visit to Williamsburg. Designed to capture your heart, the extensively renovated 1928 Williamsburg Bed and Breakfast is the perfect tranquil romantic getaway, holiday getaway or Williamsburg staycation and features luxurious king/queen beds, pristine private baths, whirlpool tubs, TVs, antiques, a cozy fireplace, bright, spacious sun room, and Williamsburg’s “nicest back porch.” Located in the Architectural Preservation District within walking distance of historical Colonial Williamsburg. It is just two blocks from the College of William and Mary and a short distance to Busch Gardens Williamsburg. Garden lovers will marvel at the beautiful, award-winning perennial gardens that abound. 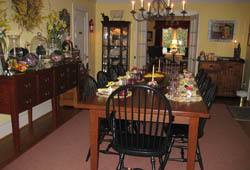 This Williamsburg Bed and Breakfast offers accommodations to suit the needs of every individual who travels to Virginia. The Washington Carriage House, which features an in-room fireplace and Jacuzzi tub for two, is ideal for a Williamsburg honeymoon, anniversaries and special occasions. The enticing aroma of our scrumptious, hot breakfast is certain to please you. Breakfast is served on our magnificent 9-foot cherry Shaker farm table - made expressly for A Boxwood Inn of Williamsburg. For more information on our accommodations, please contact our Williamsburg Bed and Breakfast. Live within driving distance of Williamsburg? Why not experience a Staycation! Skip the airline expenses, and enjoy all the activities right in your back yard. Revisit Williamsburg and relive the era of days past.